University of Lynchburg will expand its service-focused Bonner Leader Program to a four-year program in the fall of 2018. The expansion will allow first-year students to enter the program and will eventually double the size of the program to 60 students. 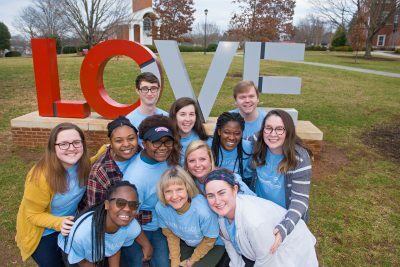 “This greatly increases the quality of the impact Bonner students can have and the depth of engagement that they will experience,” said Anne Gibbons, director of the Bonner Leader Program and associate chaplain of University of Lynchburg. Samantha Chapman ’14, a nonprofit leadership studies graduate student who works with the program, helped study the potential impact of the expansion. “A four-year approach will allow our Bonner program to become a platform that supports and shapes students during their entire college experience, allowing them the opportunity to engage in ongoing, transformative community service,” she said. The program connects students who are interested in community service, leadership, and social justice with opportunities to serve. Each Bonner Leader spends 300 hours each year working at local organizations that address issues such as poverty, environmental sustainability, and food security. The College provides work-study financial aid, allowing students with financial need to focus on service rather than jobs. The Corella and Bertram F. Bonner Foundation established its first program on a college campus in 1990 to provide students with “access to education” and an “opportunity to serve,” according to the Bonner program motto. About 65 campuses have Bonner programs today. Lynchburg’s two-year program started in 2003. Around that time, the Bonner Foundation began forming four-year programs on college campuses, in addition to two-year models. “The four-year approach emerged as the best model for engaging students in continued community service because it allows for longer-term impact on both the students and the community,” Chapman said. Lynchburg studied the idea of expanding the program for several years, and a nonprofit leadership studies class proposed the details. The change was approved earlier this semester. Having completed the Bonner program when she was an undergraduate, Chapman knows the program’s impact personally. Her Bonner alumni friends in different fields — social workers, mathematicians, and nurses — all talk about how the program helped them grow. She also knows many local nonprofit leaders who say their programs have benefited greatly from the Bonners’ involvement. “I can only imagine how extending the program length will also extend the benefits to our students and community partners,” she said.